3) Rose & Crown Dining Room – Guests who are looking to enjoy a full service meal with amazing ambiance, energy, and views are sure to love one popular restaurant found in the UK Pavilion in Epcot’s World Showcase. 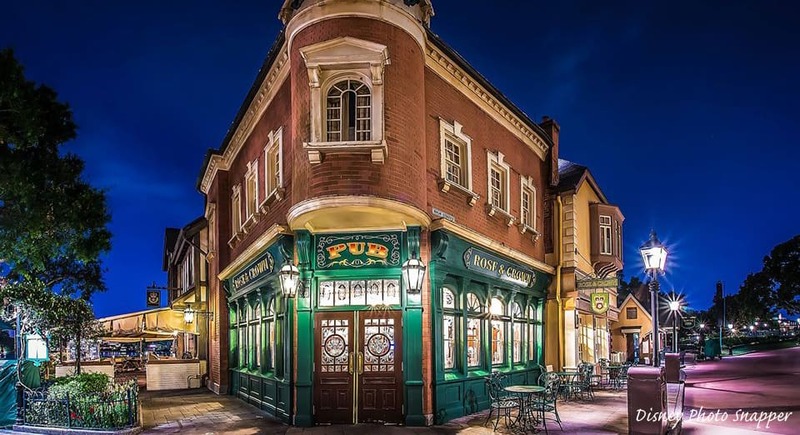 The Rose & Crown Dining Room is open daily for lunch and dinner and welcomes guests to dine in charming rooms decked out with small details that make the location feel like an authentic British pub or outside on an open air patio with beautiful views of World Showcase Lagoon. The front portion of Rose & Crown Dining Room is home to the Rose & Crown Pub which is very popular with guests and sets the lively and exciting tone for the diners enjoying a meal. Guests are sure to love menu items such as Scotch Egg, Fish and Chips, Corn Beef and Cabbage, Chicken Masasla Curry, Shepard’s Pie, Bangers and Mash, Bubble and Squeak, and English Trifle. In addition to the amazing food options, guests can enjoy a fresh pint from the bar as well as unique pub blends such as the Shandy Imperial Pint, Back & Tan Imperial Pint, Black Velvet Imperial Pint, or Golden Fox Imperial Pint.